Especially during the warmer months, it’s good to add more raw food to your daily fare. 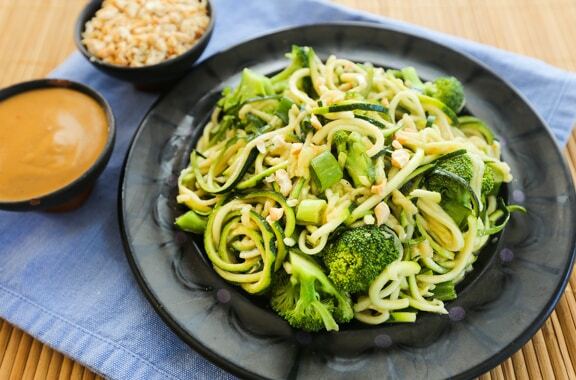 Making raw “noodles” from zucchini and other vegetables is a fun way to do just that. There are several kinds of spiralizers (AKA spiral slicers) on the market as this pursuit has become so popular, but here we’ll give an in-depth review of the World Cuisine Tri-Blade Spiral Slicer. This brand seems to be the most popular and well-rated on Amazon.com. The people have clearly spoken! 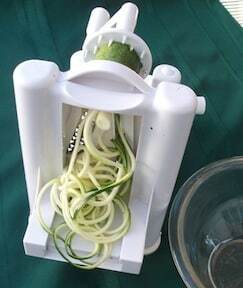 Basic zucchini noodles —here’s how they look coming out of the machine, using the fine blade. Zucchini noodles in a bowl. 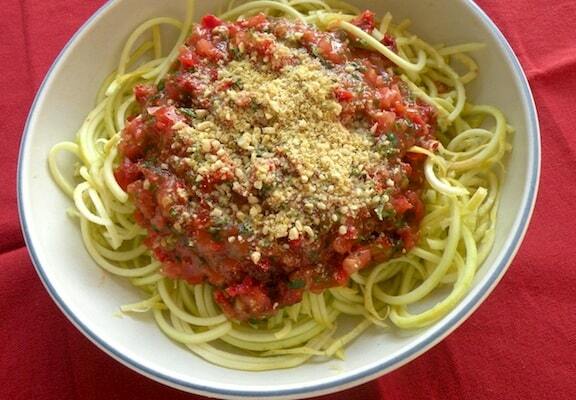 Here’s a way to use them: Raw Squash “Noodles” with Fresh Tomato Sauce. The slicer blade makes long, very thin spirals from cucumber. A very crisp cucumber is a must for this. I cut the long pieces (or was it all one piece?) into bite-sized segments and marinated them in rice vinegar and a little natural granulated sugar. After an hour or so, I poured most of the liquid off and sprinkled with sesame seeds. The same slicer blade made these pretty potato spirals. They’re so even and thin, this would probably be an incredible way to make homemade potato chips in the oven. Slicer blade, part three—I sliced an apple, and though it didn’t make spirals, it made super-thin slices that might appeal to toddlers and young children. These paper-thin slices would be perfect for using in raw apple desserts. A dehydrator would make quick work drying these, or you can bake them in the oven at a low temperature to make apple chips. The larger spiral blade made quick work of an onion—and it was tear-free! These would be nice added to roasted vegetable medleys, or sautéed until golden as a start for a stir-fry or for topping pizza. One major disappointment is that this tool comes with scant information, and no recipes. There’s a one-page flyer that comes with it, plus instructions printed on the box. Most enterprising cooks (or raw food enthusiasts, as the case may be) can figure it out, and find creative ways to use this machine, but more info would have been useful. 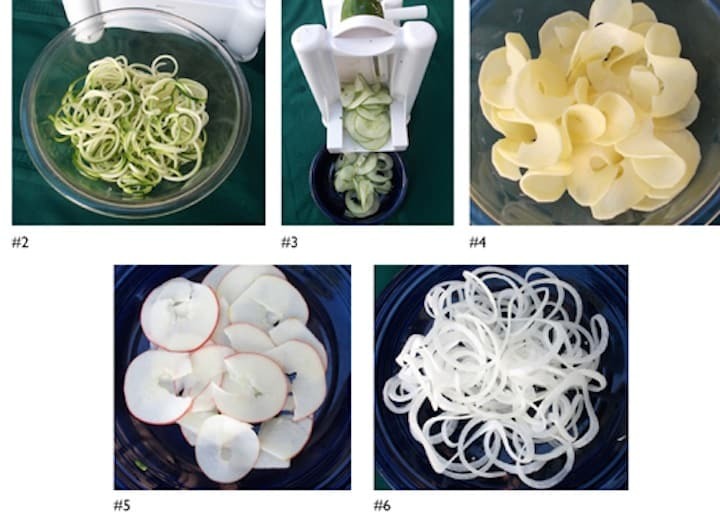 As I was experimenting, it occurred to me that making all these neat shapes and spirals from veggies (as well as fruits—see the apple slices, below) can make produce of all sorts more enticing to kids and other finicky eaters. Let your kids help make these fun vegetable cuts, and I doubt they’d be able to resist eating them. Please supervise kids, and tell them to keep their fingers away from the blades, which are super-sharp. And do the same when you rinse the blade plates—if you see something stuck in a blade, dig it out with a fork or knife, not your fingers! Can I live without this spiral slicer? Definitely. For me, it’s not a must-have like my dearly loved and daily used Vitamix. Do I recommend it? Most definitely! While it’s not something a healthy kitchen can’t do without, it’s great fun, and for anyone who enjoys “noodling around” in the kitchen (pun intended), and finding more ways to prepare produce, the small investment is worth making. See more about the World Cuisine Spiral Slicer on Amazon.com, as well as reader reviews. Thanks Nava, this recommendation is just what I was looking for. A week or so ago I finally decided to get a spiralizer after seeing them featured on several blogs for the past year or so. I ordered this one through your link. The possibilities go beyond raw cuisine. I was thinking of trying this in my Chesapeake Zuke Cakes, which are a variation on the zucchini “crabless cake” theme (since I’m from Baltimore, these are a must, hon! )Usually zucchini cake recipes call for shredding and the results can be quite watery, so I want to experiment with spiral “ribbons” and see if it makes a difference in the outcome. Oh and in addition, I need me some curly fries! Carolyn, the possibilities do go beyond raw cuisine. Coincidentally I tried curly fries (a combo of regular and sweet potato—this spiral slicer I find is a bit sluggish with sweet potato, you need to push really hard). I tried doing them in the oven at 400 degrees F. and I think it would have been better at a bit higher temp—425 or 450. I find that the zucchini “noodles” also get a bit watery, so I was going to try very lightly salting them, putting them in a colander for 30 minutes or so, and blotting. I really enjoy these with a fresh tomato sauce or pesto. Good luck and please share any interesting experiments with me and VegKitchen readers! Hi Nava, We got our spiral slicer on sale and loving working with it. Already understood about the potato curly fries not coming out as well as expected by a blogger. That didn’t effect our decision because of all the fun things you can do with it for veggie spaghettis, sides and salads. HI Millie, — glad you’re enjoying this product. Mine doesn’t get as much use in the cooler months, but I do enjoy it when the weather is warm. Enjoy! Hello Nava, this post is of the reasons why I bought my own “slicer.” Thank you so much!